A new study from the Adam Smith Institute in the United Kingdom provides overwhelming evidence that class-warfare tax policy is grossly misguided and self-destructive. The authors examine the likely impact of the 10-percentage point increase in the top income tax rate, which was imposed as an election-year stunt by former Gordon Brown and then kept in place by his feckless successor, David Cameron. They find that boosting the top tax rate to 50 percent will slow economic performance. And because of both macroeconomic and microeconomic responses, tax revenues over the next 10 years are likely to drop by the equivalent of more than $550 billion. Here’s a key paragraph from the executive summary of the new study. The country is suffering from a 50%-­plus marginal tax rate which even its architect admits was imposed without economic purpose. Now our analysis shows that the policy is set for failure: at best leading to flat growth for a decade and £350bn of lost revenue. 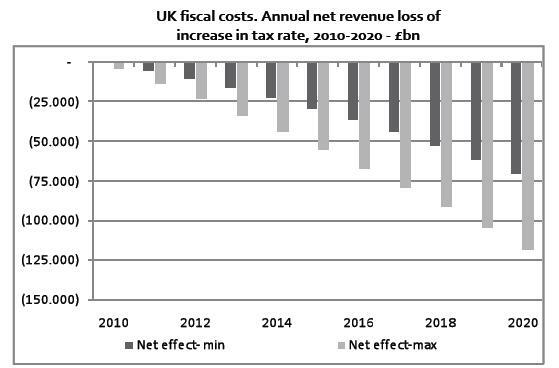 The Chancellor should seize the occasion of the 2011 budget to reverse this disaster promptly, for the benefit of public revenues, economic growth, the government’s standing with domestic wealth-creators, and the UK’s reputation with world business. The authors urge Prime Minister Cameron to reverse this disastrous policy, but the odds of that happening are very slight. I hope I’m wrong, but I have repeatedly noted on this blog that Cameron almost always makes the wrong choice when deciding between liberty and statism. President Obama wants to impose similar policies in the United States and there is every reason to expect similarly poor results. I’ve already posted evidence from IRS data showing that the rich paid much more tax following the Reagan tax cuts, so it shouldn’t shock anybody when the reverse happens if Obama is successful in moving America back toward a 1970s-style tax system. To emphasize these critical points, let’s close with two videos. This first video explains the Laffer Curve and why politicians are foolish if they assume that there is a fixed linear relationship between tax rates and tax revenue. This second video debunks the notion of class-warfare tax policy. Much true, much left out. For other perspectives there is Nicholas Shaxson, ‘Treasure Islands’ and Ha Joon Chang, ’23 things you didn’t know about Capitalism’. Interesting that the median American is still at the economic level of the mid-’70s despite massive tax reductions since then. Still from 1990 to 2005 over 90% of the US increase in wealth went to the top 10% of which over 50% went to the top 1% so let’s keep spreading Dan’s stuff to keep this going. Excellent videos! Thank you for the effort. There are a lot of laypeople like myself who need this kind of clear information so that we can make better decisions at election time. Economic and political jargon often creates a nimbus of confusion and complexity that some of us find difficult to see through. I have shared these videos to my facebook page. Please make more videos like these.